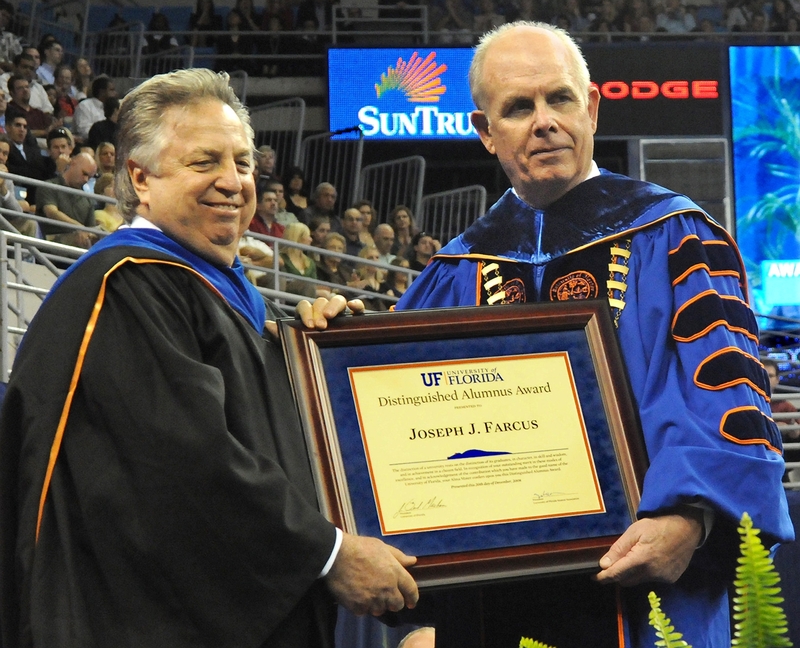 Joseph Farcus, left, received a Distinguished Alumni Award from University of Florida President Bernard Machen at graduation ceremonies Dec. 20, 2008. Farcus, a world leader among cruise ship architects, is known for his creative designs on Carnival Cruise Lines’ vessels, which are distinguished by their striking and unique décor. He has designed Carnival Cruise Lines ships since 1977 and is responsible for the interior work of the line’s entire 22-vessel fleet. Farcus has also worked with other Carnival-affiliated brands, including Holland America Line, Costa Cruises and Cunard. Farcus is a 1967 graduate of the university. He became a registered architect in Florida in 1969 and received national certification in 1970. The Distinguished Alumni Award honors alumni of the university who have excelled in their chosen field or performed outstanding service for the university.